Does the change in commenting policies at YouTube and Popular Science pose a threat to online freedom? Or is it necessary to preserve discourse on the Internet? 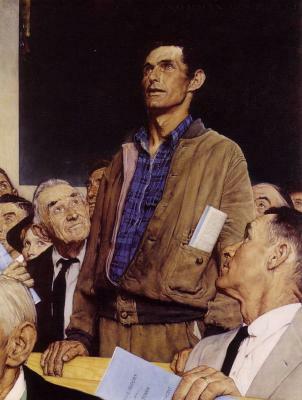 Norman Rockwell's "Freedom of Speech"
Popular Science.com announced recently that it's going to shut down its comment sections for its website. Citing a University of Wisconsin-Madison study, Suzanne LaBarre, the site's online content director, noted that negative or uncivil comments left on an online article "changed the interpretation" of the article content. "Another, similarly designed study," wrote LaBarre, "found that just firmly worded (but not uncivil) disagreements between commenters impacted readers' perception of science." A politically motivated, decades-long war on expertise has eroded the popular consensus on a wide variety of scientifically validated topics. Everything, from evolution to the origins of climate change, is mistakenly up for grabs again. Scientific certainty is just another thing for two people to "debate" on television. And because comments sections tend to be a grotesque reflection of the media culture surrounding them, the cynical work of undermining bedrock scientific doctrine is now being done beneath our own stories, within a website devoted to championing science. You don't to look far to see the consequences that informed challenges to science has on, say, public health. Take the faux belief that vaccines cause autism, a meme that proliferated on the Web, and led to disease outbreaks across the world. The measles and mumps and other avoidable diseases are no joke; children can get permanent disabilities, or even die, from the diseseases. And there is absolutely no evidence linking autism to vaccines. And yet here we are, thanks in large part to this "war on expertise" -- as LaBarre called it. Popular Science isn't the only site to move to regulate its comments. You Tube has announced new tools to enhance comment moderation. It's using Google+ to promote comments, not by recency, but by relevance, and giving uploaders more power to moderate comments -- now uploaders can preview comments and ban comments using certain words. It's a move away from the spirit of the early Internet, when it was anything goes. The Internet was where you could express anything you wanted, free from the gatekeepers in the mainstream media. Here, you could think and say about what you wanted to, not what some television or radio producer wanted you to. But the trolls have won. The most egregious example of which is the treatment of women online who dare speak on the realities of sexual harassment. Rare is the public site that isn't infested by rude or aggressive comments. Civility is a lost art online. Comment moderation and shutting down comments has become routine. Is this threatening the Internet's freewheeling ways? Or is it necessary? On a Wednesday in mid-October, the Erie Art Museum will deepen your understanding of the web through a documentary double-feature.